In a recent announcement pertaining to the pricing of the Clio Renaultsport 200, Renault said that the cost of the base model of the company's new supermini flagship - which is scheduled to hit the markets in June - will be £18,995. The announcement by Renault implies that the cost of the Clio Renaultsport 200 will be priced at an additional £100 over the cost of the Peugeot 208 GTi; and will be £2,000 more than a forthcoming Ford Fiesta ST. The high-end Renaultsport 200 Lux models - with a wide-ranging list of equipment - are priced at a £1,000 premium cost over the standard car. The more driver-focused Cup version of the car will boast a low and stiff suspension and a steering which is notably more accurate. In addition, the version will also have 18-inch gloss-black alloy wheels as well as red brake calipers --- all for merely £450. All the models of the Renaultsport Clio - the order books of which will open in on April 8 - will feature a turbocharged 1.6-litre engine with 197bhp, which is capable of accelerating from 0-62mph in barely 6.7 seconds. 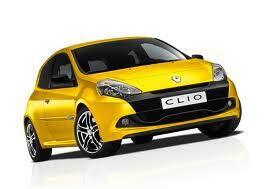 No model of the Renaultsport Clio has a manual option. All the Clio 200 model cars will have a six-speed dual-clutch automatic gearbox a as standard feature; along with a pair of steering wheel mounted gear paddles.